My first big headed driver and I love it! I'm a short hitting 8+ handicap (250 downwind) and after a couple sessions at the range, learned how to hit it - just get after it and swing through it. I went from a Steelhead Plus 11º to the 11º model (trimmed to 44"), hits it higher and straighter. It has a closed face of about 2º, which helps with the set-up and when I get out of synch. and hang it right. I wouldn't want anything bigger than the 360, preferring the clean rounded shape, and the recesses in the bottom add strength. I only wish I could trace the origin of the shaft. 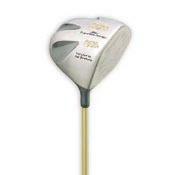 I have the R flex - my best swings are about 90 mph, and a softer shaft has always worked better for my moderate tempo. The price and guarantee can't be beat, so even if you buy one and reshaft with a top line model, you'll be way ahead of the cost of a name brand driver. And like the Master-Grip copy says, you can work both ways, though in my case I'm happy to be in the short grass. I am familiar with Pat Simmons' designs, the Tiger Shark woods from the 80's, and believe he knows his stuff. The one area where it doesn't perform is on thin hits, true to some extent for all large head drivers. I've hit Ping G2 and G5, the latest Callaway, Taylor Made 540, all good but no better than the T-Rex II. Most of them (at demo days) have 45" shafts, which most amateurs would do well to avoid and stick with 44" or shorter.